The impeachment process has begun, but it is not yet clear whether it can gain enough traction to actually topple President Rousseff. We have always felt that the opposition PMDB was in no hurry to replace Rousseff, since it would simply inherit a very messy economy. Rather, it made more sense to us for the PMDB to obstruct and generally make things miserable for Rousseff in order to be well-positioned to win the October 2018 elections. Municipal elections in October 2016 will be closely watched. Meanwhile, the “Car Wash” corruption scandal continues to widen. More and more senior politicians and business leaders have been arrested in recent weeks. Police have also raided the residence and office of lower house President Cunha, as well as other PMDB lawmakers. The situation remains murky, as Cunha and his PMDB are supporting impeachment. Are these raids on the PMDB simply political pushback from Rousseff? Stay tuned. Brazil press is reporting that President Rousseff has agreed to Finance Minister Levy’s exit. While this is a familiar report in recent months, it never fails to move markets. 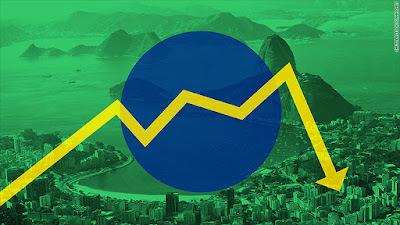 The report added that Levy has agreed to stay on for a short while until a replacement is found, and that Rousseff plans easier fiscal policy (which Levy opposes). We continue to see more downgrades to sub-investment grade as only a matter of time (see below), but a Levy exit would move up the timetable. The economy remains in recession. GDP growth is forecast to contract -3% in 2015 and -1% in 2016, with growth not seen until 2017. For 2014, GDP was basically flat. With commodity prices still falling and more policy tightening ahead (see below), we think the risks are to the downside with regards to these growth forecasts.